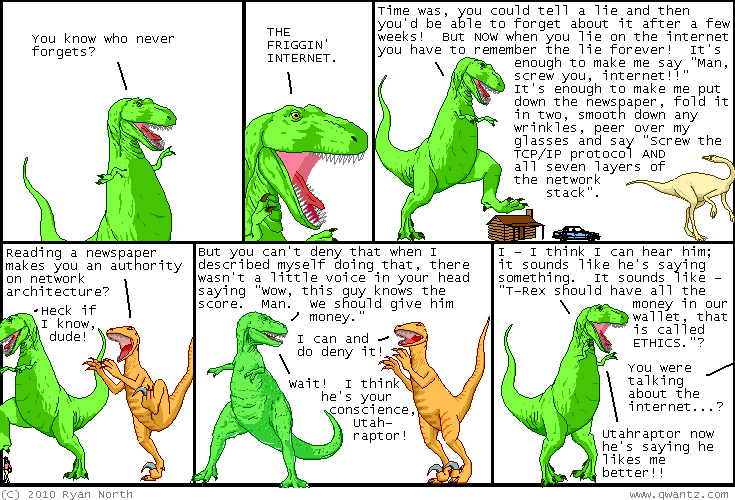 Dinosaur Comics - April 15th, 2010 - awesome fun times! Joey Comeau has a new book out, called One Bloody Thing After Another. I read an earlier version of this before it was printed, and I told him that it was the best thing he'd ever written. I really liked it is what I am saying! Joey calls it a "teen lesbian horror story" but it's also a comedy, so if "teen lesbian comedy horror story" doesn't sound like it appeals to you, just start adding adjectives till it does and then pick it up! Finally, David Malki has a new Wondermark book out and if you like Dinosaur Comics you'll probably like Wondermark, so consider this an easy choice!